Innovative solutions promoting a skilled WORKforce and EDucated society. The United States finds itself in the midst of a unique labor market problem: Job openings vastly outnumber unemployed workers. 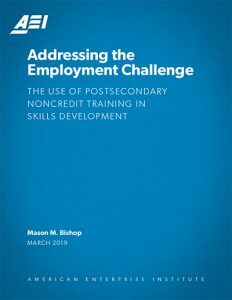 Many experts and industry leaders have attributed this problem to the mismatch between the skills that workers possess and the competencies employers need. With the skills gap presenting a modern economic problem, what should be the appropriate response to upskill workers and close the gap? WorkED Principal, Mason Bishop, has over 20 years of experience in workforce development and higher education. Mr. Bishop is one of the few people who has experience at both the national and local levels, in both workforce development and higher education, having served as Deputy Assistant Secretary for Employment and Training at the U.S. Department of Labor and as Vice President of Institutional Advancement at Salt Lake Community College. Our expertise includes an in-depth knowledge and understanding of federal policies, practices, and programs such as the Workforce Innovation and Opportunity Act, Trade Adjustment Assistance, Higher Education Act, TANF, Perkins, and others. WorkED is at the forefront of recent efforts to provide more flexible Apprenticeship options for employers, industry associations, community colleges, and workforce development boards. Whether you need help managing a project, developing a project, or evaluating the impact of a project, WorkED Consulting is thoroughly invested in your success. We go above and beyond what is expected, and have delivered results with organizations that improve employment opportunities for people and workforce skills needed by employers.